Kirk-Kiz is located outside of the medieval fortress of Termez, in the countryside, which in the last century was called Shahri-Saman that obviously correlates with the dynasty of Samanids. All facts prove that exactly they possessed this huge country estate. 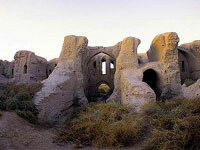 Apparently, it was a summer residence of a royal dynasty (as for a capital of Samanids, it was Bukhara). Kirk-Kiz presents an example of the monumental forms in architecture. The building has strict centralized composition. It is square in the plan (54x54 m), and is crosswise cut along axes by arched corridors, which led to central square courtyard (11,5х11,5 m) with deep arched aivans on axes, from where one can enter numerous rooms. They settled down in two floors in four sectors of the building. A total number of premises in Kirk-Kiz reached one and half hundred: there were rectangular rooms, corridors and a big hall, probably, living room - mikhmankhana. Round towers flanked the building. Adobe was used as a basic material for the construction. The walls were plastered with clay; yellowish colour of Central Asian clay is dominant here. In interiors of Kirk-Kiz amazes a variety of arched systems made of adobe. The interior decor is rather poor by details. The architectural rhythm of windows and niches worked out as various figured arches became a basic element of interior. For Kirk-Kiz typical is the combination of old pre-Islamic traditions and innovations, caused by tastes and needs of another epoch - isolation of a composition, ascetically simple surface of the walls, plastered with clay, remind the early medieval castles-keshks. But the elements of fortification were reduced, and four free entrances, numerous windows in different levels were not coordinated with defensive purposes. So Kirk-Kiz was a large feudal estate of a palace type belonging to the reigning dynasty, where in summer time, after stuffiness of dense populated kukhendiz and shakhristan in Termez, so was easily breathed amongst shady gardens and flowing channels (ariks).